“Don’t call me unless you’re bleeding.” Those were my mother’s infamous words, used when her and my dad would go out for the night and me and my brothers were left home on our own. In the days, before 93% of the U.S.adult population carried a cell phone, it was a big deal to get a phone call. See, there was once a time when going out with friends or being alone with your spouse was sacred. You paid attention to the company you were with or maybe you got lost in your own thoughts, but you did not want to be disturbed. You went out to get away. Recently David and I invited friends over for Sunday night dinner. I called Jillian earlier in the day and we decided on 5:30. So when they arrived at 6:50 PM, I applied my mom’s babysitting principle: There’s no excuse for being that late unless someone’s bleeding. In an unexpected gesture, Jillian walked in with a cake. When I protested, she said, “What kind of guest would I be if I walked in empty-handed?” Certainly not the kind of guest who cares if the hostess’s pork chops were burned to a crisp or her once puffy sweet potato casserole collapsed in a heap of doody-colored mush. I got over it and we had a good time. After dinner, we moved to the den, home to the ginormous HD stereo TV. The Grammy’s were on and we all settled in to watch. At one point, I noticed four of the seven of us, were on our cell phones texting, googling and I’m not sure what else. We don’t go out to get away anymore. We include the outside in on a constant basis. I’m not complaining, that’s the way it is. 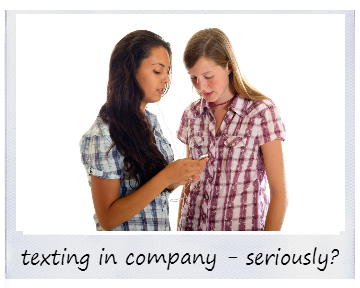 Texting etiquette says – go ahead, text away. Like indoor plumbing— there’s no going back to an outhouse for the nostalgia value. It’s because we live in this world of intentional interruption and welcome disturbance, that it’s even more important to make time to pray. Fit it into a sound bite if you must, but get away with the One, who gives you the full attention you deserve. No social media or texting. Surprising tastes and varied textures. New memories I’ll cherish forever. Help me to stay connected to You. of my strength, my peace, my hope.